KS 400 in the amixon® test center for test trials. The mixing tool is mounted and driven only from above. Assuming a powder-processing mixing and filling plant would be constructed in a way that from the involved equipment, such as bigbag feeding station, conveyor, screening machine, weighing system, mixer, silo, filling and packing station, etc., all powder residues flow out automatically and completely, so that only dust residues remain. Then manually cleaning the system would no longer be needed in many cases. In order to make sure that any dust residues below the detection limit are eliminated during a recipe change, a rinsing batch would be run using a suitable powder. Of course, this procedure is only possible, if dry cleaning is sufficient and no intense odors or colors have to be cleaned off. The idea of ​​a completely discharging process machine is not new. EHEDG, for example, has developed many guidelines for hygienic design. In addition, there are European standards such as EN 1672-2: 2009 Food Machinery / General Principles of Design / Part 2: Hygiene requirements. What's new is the design of a powder mixing machine called KoneSlid®. The mixing chamber has a cone, the tip of which has been cut off and, conversely, inserted into the mixing chamber. It acts there as a displacement body and discharging valve. A spiral mixing tool rotates in the mixing chamber. The mixture is moved upwards at the perimeter of the mixing chamber and ﬂows downwards in the centre. 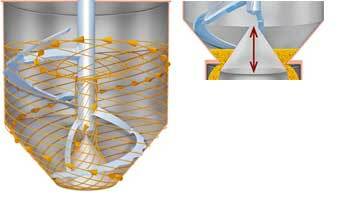 As it ﬂows downwards, the product stream is conducted to the periphery by a conical mixing element. After about 4 revolutions the entire volume has already been completely shifted by the mixing tool once. The ideal mixture quality is achieved after approximately 20 to 30 revolutions. The energy input is minimal, so far, the mixing process is very gentle. The particle shapes and sizes remain unchanged. 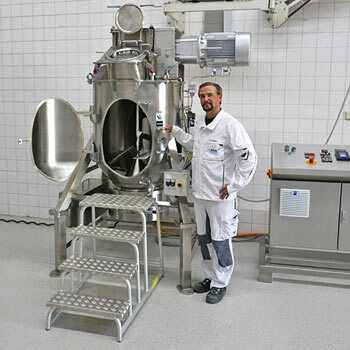 The KoneSlid® mixer has been developed especially for goods resulting from spray drying, fluidized bed granulation or belt drying; the particles can be of different sizes and fragile. Examples of this include instant beverage powder, dry milk derivatives, but also instant soups, baby formula, cereals, frozen foods, tablet masses and metal powders. Even faster than the mixing process is the discharge, which takes place by means of the closing system moving downwards. The mixture ﬂows out within a few seconds. Usually no conical piles are formed in the container positioned below. The mixture is completely discharged, apart from minimal dust residues.